Now officially sailing the high seas and on its maiden voyage, the Celebrity Edge has taken the cruising world by storm. Christened “the most revolutionary” ship at sea, the Edge takes the cruising experience to an elevated level. What one might know to be modern class enjoyed in the comforts of our urban enclaves is now fulfilled and brought to even newer heights at sea. 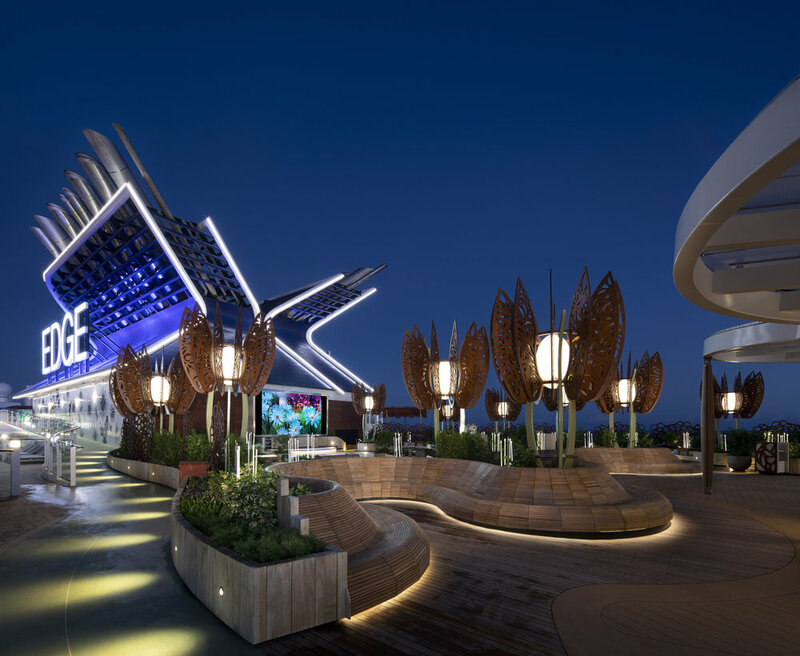 The Celebrity Edge is the stunning product of various renowned designers and state-of-art technology, having been the first ship to be completely designed in 3-D.
With its outward facing design to make the destination experience even more immersive, Celebrity Edge will surely have guests feeling more connected to the places they visit - perhaps even cultivating a new generation of cruise lovers. Edge Stateroom with Infinite Veranda is 23% larger than Solstice Class veranda staterooms(bathroom space is 10% larger). All standard-sized staterooms are fitted with king-sized cashmere mattresses part of the exclusive Celebrity Cashmere Bedding Collection In-room automation allows guests to control and personalize everything a simple touch screen, including lighting, shades, temperature and service. -The Retreat Sundeck Total Square Footage: 12,701 sq. ft.
-The Retreat Lounge Total Square Footage: 2,756 sq. ft., plus an 829 sq. ft. outdoor terrace with connection to the Suite Sun Deck - a total of 3,585 sq. ft.
-Luminae @ The Retreat Total Square Footage: 4,133 sq. ft.
-Resort Deck Total Square Footage: 7,192 sq. ft.
-The 365 meter jogging track spans Decks 15 and 16. -The Martini Glass-shaped hot tubs are sespended 22 ft. over the pool deck. Each hot tub has an overall radius of 9.68 ft.
-Rooftop Garden Total Square Footage: 8,073 sq. 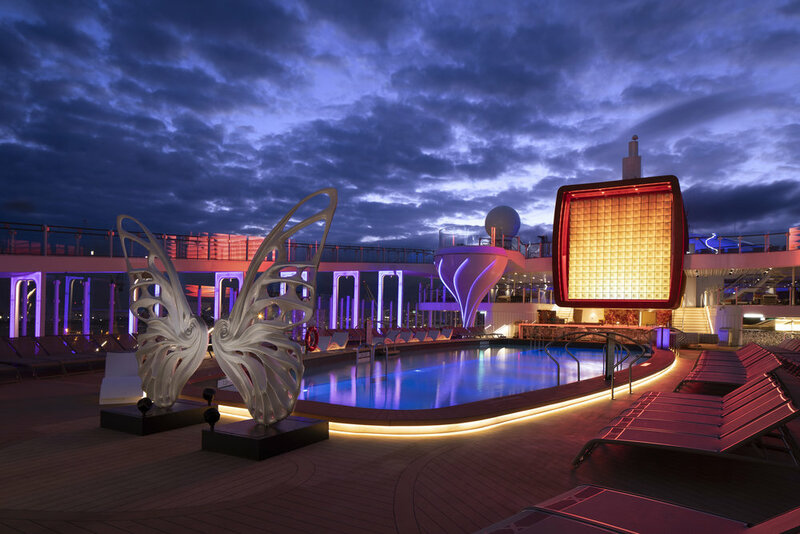 ft.
One of the most popular spaces on any Celebrity ship – the adults-only Solarium. Celebrity Edge continues the tradition of offering a covered pool area where adults can unwind in modern luxury style. The Solarium is home to one of Celebrity’s most popular culinary offerings, The Spa Café and Juice Bar, which offers a creative take on healthy cuisine, featuring an eclectic blend of offerings that are both flavorful and healthy. The three-dimensional art wall that represents the beautiful colors of sea glass and water-swept textures of the ocean is the perfect complement to the serene atmosphere where guests can restore both their tan and their peace-of-mind. -Solarium Total Square Footage: 3,360 sq. ft.
Perched on the starboard side of the ship, the Magic Carpet makes Celebrity Edge’s distinctive, sleek profile recognizable from miles away. With its stunning, open-air panoramic, outward-facing ocean views, Magic Carpet is designed with a yacht-like, breezy, and casual vibe, with comfortable seating, a full bar, and space for live music performances, making it the place to see and be seen. The size of a tennis court, this incredible engineering feat is the world’s first cantilevered venue at sea that travels 13 stories. This spectacular space is repositioned alongside several decks and transforms into a new and exciting venue depending on which deck it’s positioned. -Margic Carpet Total Square Footage: 1,937.5 sq. ft.
-Magic Carpet Length: 110 ft.
-Magic Carpet Total Width: 20 ft.
-Destination Gateway Total Square Footage: 1,784 sq. ft.